When visiting KICC please enter via the IoA entrance on Madingley Rise where our main reception area is located. The Institute of Astronomy main entrance is situated on Madingley Rise which joins Madingley Road opposite JJ Thompson Avenue. The map of the KICC site shows available parking. The main car park is the first entrance on the right after leaving Madingley Road and has about 30 parking spaces. Additional parking is available (out of office hours) further up Madingley Rise. If you follow the main rise up and round where it turns to the right there is a larger gravel car park to the right (with about 50 spaces) and more parking in front of Greenwich House right at the end of Madingley Rise. Alternatively parking is available at the Park and Ride, which is less than 10 mins walk away from IoA, along Madingley Road, and also nearby street parking is available along Clerk Maxwell Road. A disabled parking space is available immediately outside the main entrance. A citi 4 (or uni 4) bus is the best route from the city centre to the Institute of Astronomy, though the service is infrequent, especially on the return journey later on in the evening. Ideally leave the bus at the stop at the entrance to JJ Thomson Avenue and cross the road to Madingley Rise. General information about UK train services is available at the National Rail Enquiries website. In general, trains are quicker but more expensive than coaches. Stagecoach Cambus runs services between Cambridge rail station and the city centre, or take a taxi from the queue just outside the station. There are regular train connections to Cambridge from London. Trains depart from King's Cross or Liverpool Street stations in London. The journey time of the faster King's Cross trains (Cambridge Cruiser trains) is about 45 minutes, while the other trains are slower and take around 70 minutes, or longer. Maps of the London underground are available on the TFL website. London can be reached from Paris or Brussels by the Eurostar train which uses the channel tunnel. You will arrive at London St Pancras International station. King's Cross station is next to St Pancras, so walk to King's Cross and catch a train from there to Cambridge (timetables). There are frequent coach connections from the centre of London to Cambridge. These depart from Victoria coach station (near Victoria railway station) and take about 2 hours (more in peak hours). Coach tickets can be bought from the driver. Please note that delays are common because of heavy traffic in and around London. The Cambridge coach station is close to the city centre and there is an adjacent taxi rank. Long-distance coach services are run by JetLink and NationalExpress. A combined timetable can be found at the National Express website. Stagecoach Cambus runs services in Cambridge and to/from nearby villages and towns. The University has compiled further information on local bus travel. This is the closest major airport, about 25 miles (40 minutes by car) from Cambridge. It is well served by airlines flying to European destinations. For flight information contact the BAA Stansted website or contact the airlines directly. 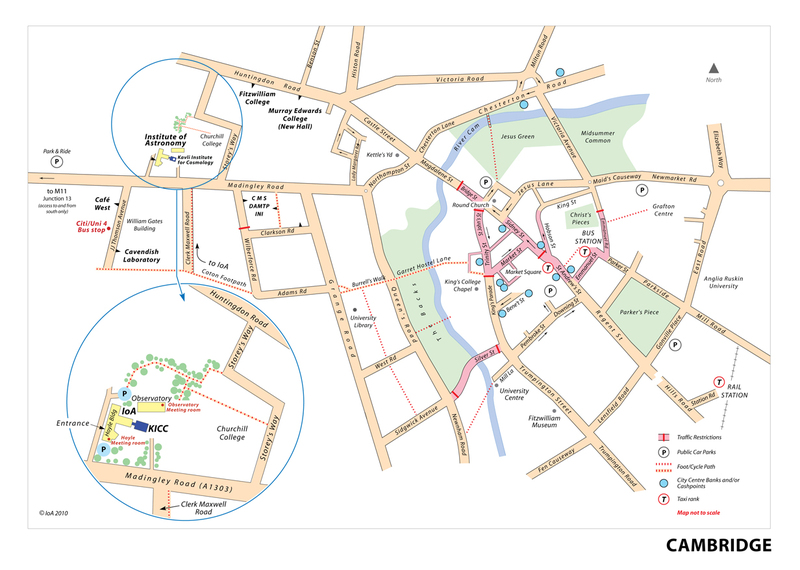 Cambridge is within easy reach by rail, coach or taxi. The railway station is part of the terminal. The services to Cambridge run frequently and take about 30 minutes. The service operates seven days a week, the first train departing at 05:51 (Monday to Sunday). The last direct train to Cambridge departs at 21:18 Monday to Saturday and 22:40 on Sundays. Many airlines fly to London Heathrow. There is a direct coach service to Cambridge (JetLink 797) which operates every 2 hours at 20 minutes to the hour and the journey takes 2 hours 20 minutes. National Express web site. Another coach (JetLink 787) departs at 20 past every 2 hours but the journey takes 20 minutes longer than the 797 service. A fast train service, the Heathrow Express, connects the airport with London Paddington station. From there use the Underground to connect with rail or coach services listed above to reach Cambridge. The Circle and Hammersmith and City Lines operate between Paddington and Kings Cross. We suggest you take the Piccadilly line from Heathrow Airport to Kings Cross. Change to the main line Kings Cross station, from which fast trains depart to Cambridge railway station. Black cabs outside the airport can be three times the price of a pre-booked taxi. This airport is located to the south of London. The Thameslink service (operated by First Capital Connect) from Gatwick Airport to St Pancras is the most efficient way to reach the King's Cross mainline station (which is situated adjacent to St Pancras) and take the fast trains to Cambridge. The Gatwick Airport railway station is accessible from the South Terminal. We do not recommend travelling from Gatwick to Cambridge by coach. The journey takes about 4 hours. Some budget airlines (e.g. EasyJet) use Luton airport, which is about 35 miles from Cambridge. No intercontinental flights operate from Luton. Contact the Luton Airport web site for a list of operating companies. There is no efficient train connection from Luton airport to Cambridge, but there is a coach service (JetLink 787) once every two hours, departing just outside the terminal building. It takes about 1.5 hours to reach Cambridge. The City airport is located very close to the centre of London. It serves major European cities. See the London City Airportweb site for details. There is a shuttle bus from the airport that connects with the London Underground network.